In this classic book, the distinguished science writer Horace Freeland Judson tells the story of the birth and early development of molecular biology in the US, the UK, and France. The fascinating story of the golden period from the revelation of the double helix of DNA to the cracking of the genetic code and first glimpses of gene regulation is told largely in the words of the main players, all of whom Judson interviewed extensively. The result is a book widely regarded as the best history of recent biological science yet published. This commemorative edition, honoring the memory of the author who died in 2011, contains essays by his daughter Olivia Judson, Matthew Meselson, and Mark Ptashne and an obituary by Jason Pontin. It contains all the content added to previous editions, including essays on some of the principal historical figures involved, such as Rosalind Franklin, and a sketch of the further development of molecular biology in the era of recombinant DNA. Part III: PROTEIN  Structure and Function: The solution of how protein molecules work. AFTERWORD II: What Did Erwin Chargaff Contribute? 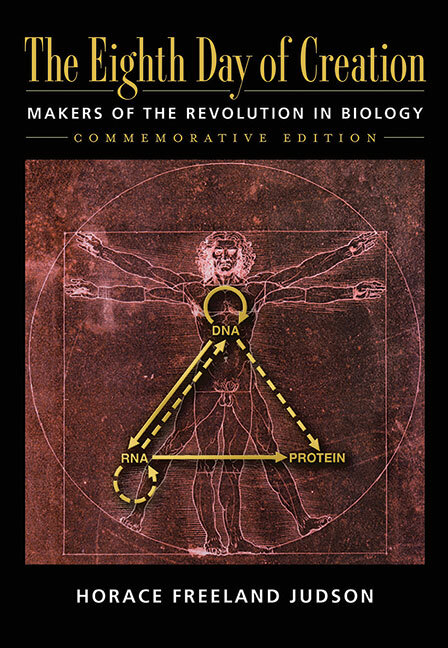 "A historian has mused that the memory of man is too frail a thread on which to hang history; Judson's achievement, in drawing out the memories of so many participants in the epic of molecular biology and weaving them into a single robust skein, is magisterial. His work fittingly commemorates a golden age which already seems as remote as that of Darwin and Huxley."
. This epilogue obviously is not meant to bring Judson's original story up to the presentthat would take another large bookbut only to point readers to topics that Judson leaves for other historians to explore.